The Saucony Kinvara 3 provides a great run with support where it’s needed and light material throughout. A great shoe for various workouts on nearly any terrain. Middle and distance runners seeking a lightweight, semi-cushioned ride or runners looking to transition to minimalist shoes. Redesigns can be tricky — especially in the running shoe world. People develop near-fanatic attachments with a particular year’s shoe model—tracking down multiple pairs as new editions are ushered in. Simply put, shoe fanatics need not stress over the newest Kinvara—a massive success for Saucony which has seen its third iteration come to stores this summer. The latest version retains the form and function of the Kinvara 2, but swaps out material and construction in many beneficial areas. The outsole is more durable, the upper material is other-worldly, and the general running experience remains the same. For those who are not keen on change, don’t be afraid of the Kinvara’s new design. Quite frankly, a shoe that looks this good, and runs this smooth, could convert even the most stalwart fan of the last version to lace up a new pair. I have worn each version of the Kinvara since its release in 2010, and have found them to be a shoe I recommend often to friends and family looking for a lighter shoe that does not completely eschew cushioning and support. I feel comfortable doing the same about the latest version—and perhaps even more so. After trying the latest Kinvara, I went through my closet to compare them to both the Kinvara 1 and 2, seeking to better define the differences in each iteration. The first version’s toe box was a bit narrow, but was widened in the second version. 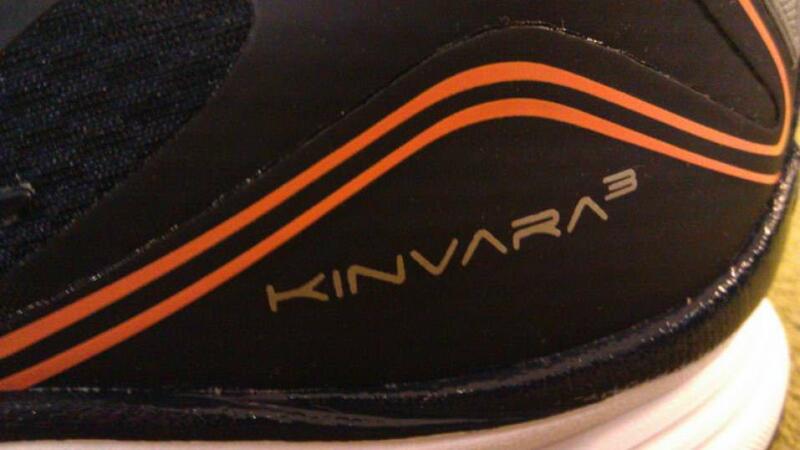 The upper material in the Kinvara 2 was sometimes thick, but was lightened considerably in the Kinvara 3. These subtle differences define the approach Saucony is taking with this popular model: small changes and improvements instead of drastic alterations. The result is a shoe that ultimately rides smooth and comfortable, built upon a series of steady changes that could go completely unnoticed. A great all-use shoe, the Kinvara 3 is well-suited for track workouts, trail runs, and road races. The sole unit on the Kinvara 3 features one of the largest changes to the model’s design, featuring a more durable outsole with reinforced rubber on impact zones near the lateral section of the sole. 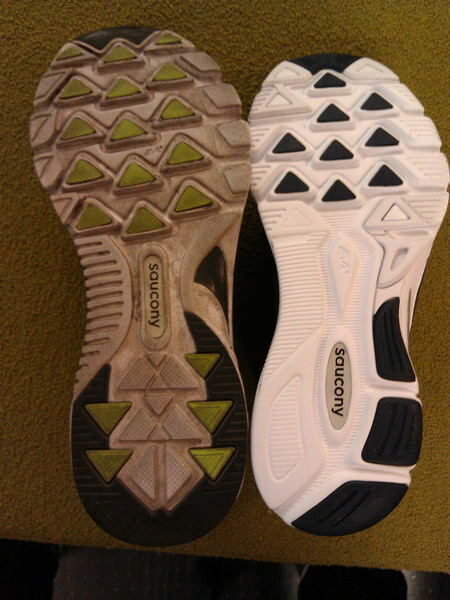 In early testing, the outsole felt slightly less flexible than in previous versions of the shoe. This is a minimal difference, however, and is worth experiencing if it means the outsole will wear less easily than it has in previous years. The inclusion of carbon rubber in commonly-worn down sections of the outsole is a major improvement, helping to delay wear on a shoe which lacked a sturdy blown rubber outsole material in years past. This was one of the few complaints I had with the shoe—a month into continual wear, and the outsole would start to show its age. So far, the latest Kinvara 3 doesn’t fall suspect to the same wear, and I’m all the happier for it. The Kinvara’s latest upper is the show-stealer. It’s not every day that a shoe’s upper steals my attention, but the complete redesign on the upper stands alone in the shoe market today. The flexfilm material, copped from Saucony’s racing shoe line, is a bonded plastic resin that attaches to a lightweight mesh. The result is a sturdy, incredibly thin upper with sock-like flexibility. There are no layers, and no stitching within the upper—and it’s easy to feel the difference. I experienced no blisters or callusing when I first began to wear them, something I couldn’t even say about the Kinvara 1 and 2. The toe box is similarly shaped to the Kinvara 2, which comes as welcome relief for me. This element is still up for debate as far as comfort and flexibility are concerned, as some runners find the toe box to be too narrow on the model still. With a moderately-wide forefoot and a second toe that extends beyond my big toe, I didn’t experience much (if any) discomfort in this area. Paired with a good pair of thin socks, the Kinvara 3 allows feet to breathe on long runs without exposing too much of the foot to mud, dirt, or wetness. I’ve been wearing and testing Kinvaras since they debuted, and I still find the shoe to be a great option for long-distance minimalist runners and people looking to transition out of heavier, more cushioned shoes. The major aesthetic changes to the shoe belie what is still, at its core, a shoe that is similar to previous models. Outside of the inclusion of new, lightweight material and reinforced elements in the outsole, the Kinvara 3 features slight tweaks to the overall running experience. If you’ve been looking to try out the Kinvara, or have been looking for a good shoe to transition to minimalist running, there’s no better time than now. I am 6′ 2″ and 215 pounds. I am a neutral runner and overpronate a bit after running more than an hour, but still pretty neutral. I mostly run in “heavy” cushioned shoes, like Pegasus and Lunar Glide but I’d like a more lightweight shoe for races, especially half and full marathons. I tried the Kinvara 3 from a friend and loved the feeling but only did 5k in it. My question is, if I buy this shoe, will I be able to log at least 200 miles in it before it breaks down? Am I too heavy for this shoe? My one big complaint with the Kinvara has always been durability–I feel like the shoes do begin to show wear around 200 miles for myself, and I’m about 6’2″ and 180 lbs. I think from a performance standpoint that the shoes might be a good option for you, but given that I feel the wear and tear around the mileage point you’ve specified, I have to say that they might not hold up as well as you’d want them to once they’ve got miles on them. I’ve been running with Nike Pegasus and I used to love the model but lately I don’t enjoy the feel of them, so I’m considering moving on to minimalism. I have narrowed my options down and now I’m torn between the Kinvara 3,since the 4 hasn’t been launched in my country, and the Pure Connect 2. Which one of these models would you recommend me? I’ve read their reviews but I’m still torn. Great question. I was fortunate enough to try out the new Lunarglide, so I’ve tried out all three shoes you’ve mentioned. It depends on what you’re looking for. I found the Lunarglide to have a somewhat “bouncy” ride–if you like that element of the shoe, then I would veer toward the PureConnect 2 since it has a somewhat bouncy feel as well. If you took issue with the bounciness of the Lunarglide, then I would say the Kinvara 3 would be your best bet. 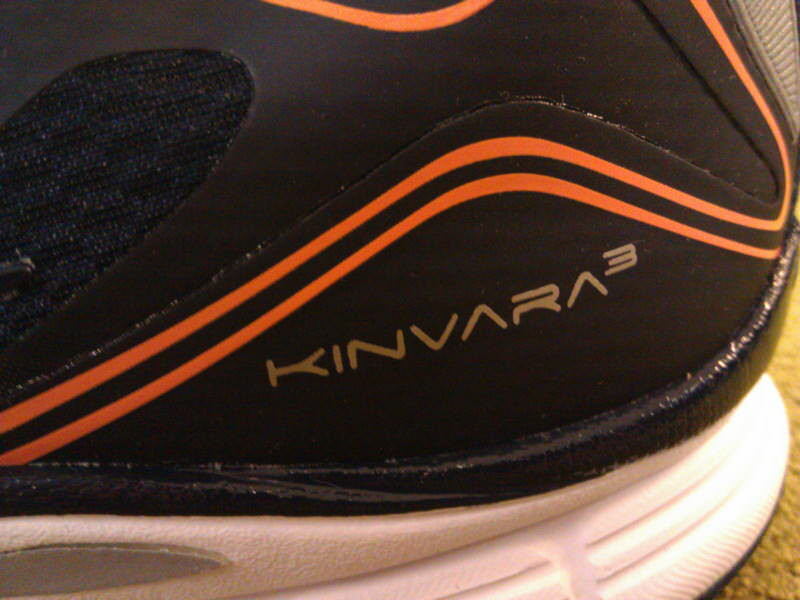 To be honest, I think the Kinvara 3 is a very strong shoe–perhaps a bit stronger than the 4, even. I’d recommend the 3 just as quickly as the 4, so if this is your most easily-available model, I’d consider picking up a pair. Thank you very much for your advice, I’ll definitely try the Kinvara 3. Hi Brian! Thank you for your great reviews. Now I am running on Cortana. Do you think there are many differences between the two shoes? I have read many things about the cushioning, and I am afraid a bit of kinvara. I am around 180 pounds and 6 ft 3 3/4 in tall. I want them for marathon distances. Thanks for the kind words–glad you’re liking the reviews! To be honest with you, I haven’t had a chance to run in the Cortana but based on the difference in specs, I think the two shoes are more similar than they are different. 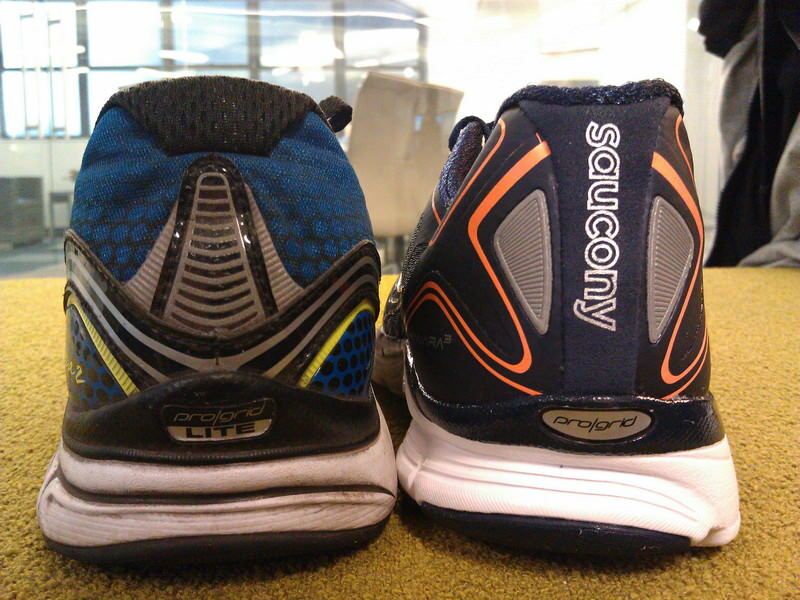 They have a very similar profile, with the only big difference being cushioning. With that in mind I think the Kinvara could be a good fit if you’re a fan of the Cortana. I ran and trained for my last marathon in the Kinvara 3 and I was happy with the amount of support they provided. You and I have roughly the same build, so I wouldn’t be shocked if your experience with the Kinvara would be similar. Keep your eyes peeled for our Kinvara 4 review, which is coming soon! Thanks for all of this helpful information! I’m wondering if you can offer any advice… I’ve been running in a couple of pairs of Hurricane 14’s, and I need to replace them. (I run about 50 miles a week.) I’ve long been a forefoot striker (back when my running style was just odd). I chose the Hurricanes because I wanted to experiment with a reduced heal drop, and I loved them from the moment I put them on. It just felt right. I love the forefoot padding, but there’s been something off about them. I’m wondering how the Kinvara 3s would compare with regard to forefoot padding? Similar? Less? I’m a bit wary of moving to a shoe with less as the Hurricanes have been the first shoe I’ve ever worn that had some cushioning/support where I wanted it. Thanks for the question–I’ve never had the chance to run in the Hurricane 14, but my initial assessment after running extensively in each of the Kinvara versions to date is that you might be in good shape if you’re looking for something lighter. The forefoot is not a cushy experience by any means on the Kinvara–the rubber is definitely on the hard side, and the shoe by itself isn’t what I would consider cushioned despite having a decent heel drop. If you’re wary of going for anything less than what you’ve got on the Hurricane, I’d be careful. However, if you’re a forefoot striker and want to see if you can shave some weight off your shoes, the Kinvara may not be a bad option. Considering the Kinvara 4 is coming out soon (and will be reviewed on RSG even sooner! ), perhaps finding a pair of the 3 at a discount might not be a good way to try them out without paying retail? Thanks a lot for your thoughts, Brian. I may just have to get my feet into a pair in order to see what they feel like. Shaving weight would certainly be nice, so I’m intrigued. Again, thanks for this webpage and your generosity. 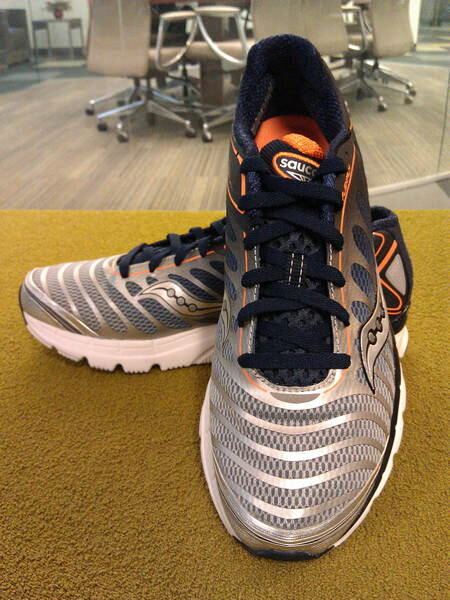 This is my first time wearing Kinvara3, having made the switch from NB Ionix 3090. There were 3 striking difference. First the upper unit while no doubt wide and well suited for those with wide feet feels quite plasticky and tacky, it does not quite adhere and nor wrap comfortably round the feet. I might need more time to get use to it, maybe I need to wear it in a little more. Secondly, the mid sole is rather firm and does not feels spongy at all. My left foot is neutral, but my right one is a little supination. Do you recommend me KINVARA 3? Thanks, Fasser, for the question. It’s difficult to say–what do you run in currently? If you’re accustomed to minimalist shoes with a bit of cushioning, this could be a good fit. You may want to see if orthotics in your right shoe could be helpful, and at that point you need to see if they’ll fit in the somewhat-slim profile of the shoe. Hi – I am lloking for a shoe to move from my Nike Flex 2012. I love this shoe & have had no problems at all with it but it’s my first real running shoe and have progressed since I bought it originally 9 months ago. I am a neutral, mid-to-fore foot stiker. Would the Kinvara 3 or 4 be a suitabl next step, in your opinion? I’ve been looking at Free 3.0 v4, and recommended Brooks Zero as well..
Great question. I think the Kinvara could be a great fit for you coming off the Nike Flex 2012. If you’re happy with the model you have now, though, I would consider sticking with it. I’m a bit conservative in this sense, but to me, once I find a shoe that works, I do what I can to keep with it until something feels different. To each their own, naturally! In this case, the shoes aren’t too different structurally that there would be too much of a change, so I think you’d be fine. Kinvara is good. However it has some arch support which bothers me. I don’t know why they designed a minimalist shoe with arch support. Too bad. Can you please give me an advice related to my question above? It would really be helpful to understand how the kinvara relates to the excel 33 (or the nimbus, as a matter of fact) in terms of size and fit. It’s really tough to say, to be honest, since the Nimbus and the Kinvara are so completely different. The Nimbus felt very springy in the heel, the upper is far more cushioned, and the entire “feel” of the shoe is different. The Kinvara, by contrast, feels much more spartan–less cushioning in the upper and a harder foam in the sole. I haven’t reviewed the Asics Gel Excel 33, so I can’t speak from personal experience. I would say, however, that this shoe would have more in common with the Kinvara since it is a neutral trainer. The Excel 33 stood out with our reviewer due to its lightweight feel and breathability. It is going to provide more stability and cushioning than the Kinvara, certainly, but should be an easier transition than the Nimbus. Just started running in these because of the recommendation on here. I am doing a few week transition out of my Asics Gel Excel 33’s, switching back and forth every run. The 4mm drop is a big difference, and the first run my achillis on my right foot was a bit sore. It has now gone away, and the Excels are starting to feel heavy. I did the same transition in to the Excels from GT-2170s, and the change feels about the same. I am really enjoying these Kinvaras! I am actually intending to follow the same trend as you. I currently own a pair of Excel 33 but thinking to move to the kinvara. Can you tell me how is the fit compared to the excel? The asics I have are 9.5 US. I want to order the kinvara online and since there is no physical store I can try them nearby (I live in Romania, I am in a bit of doubt. Can you help? Looks like I should have come back to read more! I still use both shoes every week. I have almost 300 miles on the Excel 33’s. The fit between them is very different. The Excel is very constructed on the upper, especially at the heel, where the Kinvara is less so. The Kinvara doesn’t have a structured cup heel, but I really like that. It is flexible, and super light. The Excels are very comfortable on my longer runs(9 mile+), and the Kinvara’s are used for my 6 mile and under. I will be removing the Excels out of rotation in the next few weeks and will be getitng a pair of the new Saucony Virrata’s. I have gotten more fond of less heel drop with the Kinvaras, and plan on staying in the 4mm-0mm moving forward. I LOVE the Excels, but want to move to lighter and more flat shoes. In short, I think that you will really like the Kinvara 3’s, or hold out till April/ May for the Kinvara 4’s! Spot-on observations. As a heads-up, we just got the Kinvara 4 from Saucony, and a review should be forthcoming. Let us know what you think of the Virrata, either in the comments here or on Facebook or Twitter! Sounds great, I should be picking them up next weekend! I’d like to ask which would be a better shoe to transition into minimalist running and improving my form? I’m currently looking into New Balance Minimus Zero, Kinvara 2, and Kinvara 3. I’ve been running in K Swiss K-Ona’s and the New Balance 1260v2’s. I normally run with the whole of my feet touch the ground at the same time(some say it’s midfoot, some say it’s not, so I’m really not sure what to call it. lol), and when I sprint I automatically switch over to forefoot. I strongly recommend the Kinvara 3 as a “gateway shoe” to minimalism. I thoroughly enjoy running in the New Balance Minimus Zero and gave them a thorough review last year (http://www.runningshoesguru.com/2012/02/new-balance-minimus-zero-running-shoes-review/), and would recommend them highly as a fully-fledged minimalist shoe. 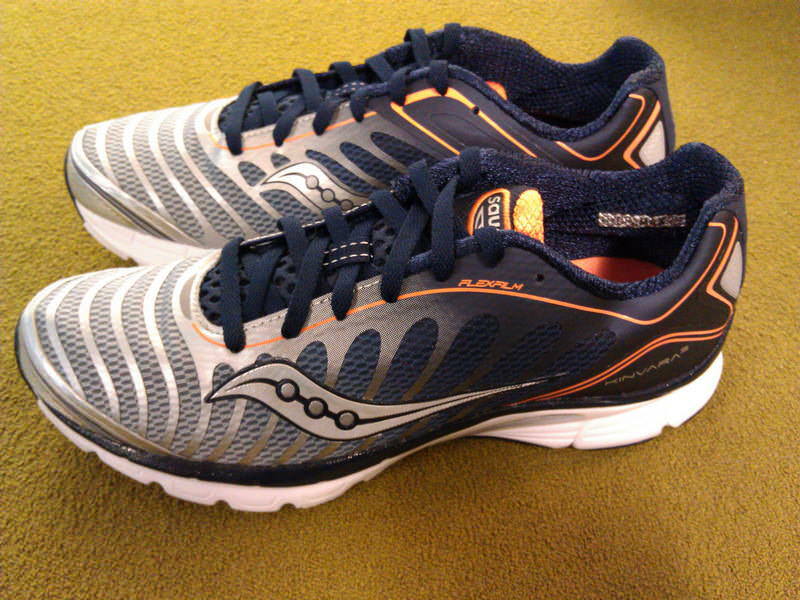 The Kinvara 3, however, acts as a great “step-down” shoe between more cushioned models and a fully-minimalist shoe. 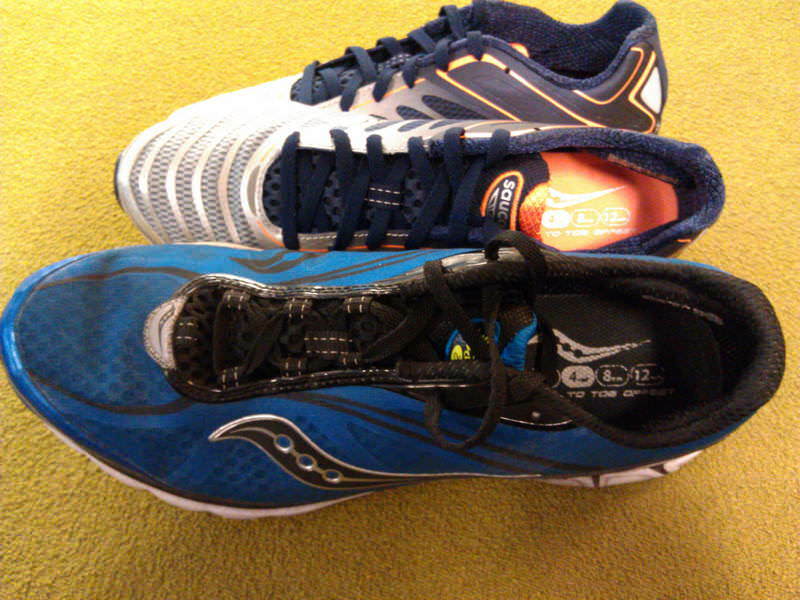 I rotate both the Kinvara 3 and the Minimus Zero through my runs now and really enjoy both models. Thanks! Will give them a try! how does the size compare? the 1st edition seemed to be a little short. what is your take on the 3 compared to other brands you have tested? Great question. I felt that the first Kinvara was a bit on the narrow side, but that the 2 and 3 have widened and expanded some with each new version of the shoe. The snugness of the first version isn’t felt with latter ones, so I’d say they’ve increased the dimensions of the shoe for a better overall fit. I have logged 162 miles on the Kinvara 3 in a 4 week period and the shoe seems the same as when I first put it on. I liked the wider toe box on the Kinvara 2 because I have Barney Rubble feet but after about 50 miles it started to loosen up and was more like a sock than a shoe in the upper. I was able to get a good 400 miles out of the Kinvara 2 before I had to get new ones. Hope to get the same or longer life out of the Kinvara 3 as well. If you are looking for a good minimalist shoe that still lets you run on gravel with no pain this is the one I would pick. Hoping in the Kinvara 4 that they make the lower a little more flexable. 3) The new “pods” don’t address the lateral midfoot/forefoot area. My K3s showed material wear on the outsole after only 10 miles. I agree with you, Brad, about the wear issue. For me, a little wear is what really makes the shoe comfortable. The first few miles are always a little awkward for me in these shoes, so at least from a personal standpoint I’m okay with the outsole wearing a little earlier than it does on other shoes.